We Americans, likewise, duck our crime of murdering millions of turkeys at Thanksgiving, with another joke. Ha ha, let’s “pardon” this turkey. Let’s playfully pretend this turkey is a prisoner on death row and “give” her the gift of life. 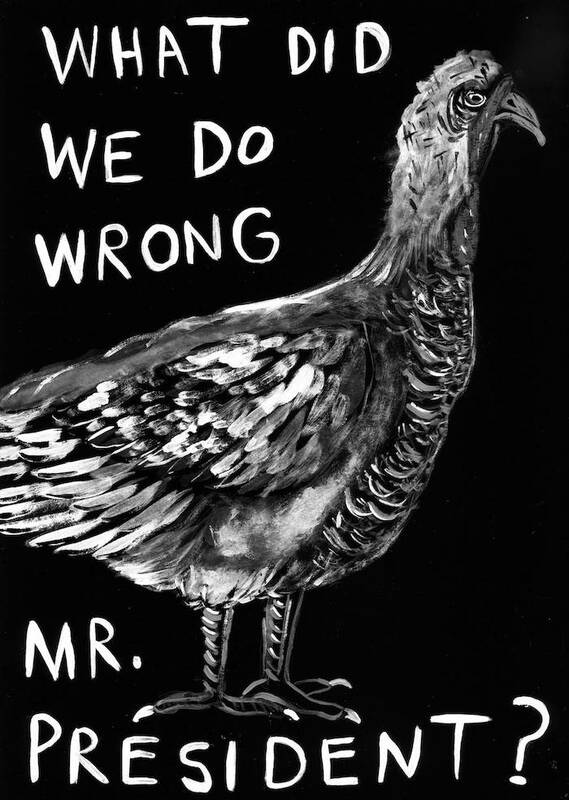 For a moment, we can forget about all the millions of turkeys who ARE on death row. The Presidential Pardoning of the Thanksgiving turkey is, at its surface, a joke. It started back during the Ronald Regan administration, as the president was trying to duck a question from the press about whether he planned to pardon those involved in the Iran-Contra scandal. Instead, Reagan decided to pardon a ceremonial Thanksgiving turkey. He ducked his responsibility for the crime of trading hostages for weapons with a joke. Whew, do Americans need some anaesthesia! It’s my belief that nearly everyone shudders at the prospect of hurting animals. Why do our friends and family insist that we don’t talk about animal cruelty? Why are so few people willing to look at videos and films showing the abuses and murders implicit in the animal agricultural industry? Lurking in our collective unconscious is a fear, a terror, if you will, of inflicting pain on others – human or non-human. Yes, I think there’s a basic human altruism in our souls but there is also a belief that if we hurt others something bad will also happen to us. We may be banished from society or suffer karma or even hell. Yet the vast majority of Americans eat animals, while caring for animals, inevitably experiencing on some level, cognitive dissonance. We turn to the communal joke instigated by the President of the United States, no less, to dodge the fear, relieve the discomfort and heal the wound. Huddling around the television we share a laugh with our family and with our animal-consuming culture. I was surprised that the Presidential Pardoning of the Thanksgiving Turkey only dates back to the ‘80s. It has the mystique of a ritual rooted deeply in our American history. Maybe it’s because this epic tragedy of slaughtering animal is, in fact, deeply rooted in our human history. And maybe that’s why Thanksgiving is so difficult for those of us who have been willing to face the reality: killing animals for food in this land of plenty is wrong.